Anuradha is a passionate runner and a mother of two young men. She ran 13 full marathons in 2013! This article has been written by her and edited by me. A dream come true through the sheer power of intent. The run is organized by Marathon Tours and Travels headed by Thom Gilligan based out of Boston (the Indian counterpart being Active Holidays). This race is usually sold out for 3 years and if there is a drop out, a runner might be accommodated. My friends registered for the marathon. And their registrations got confirmed due to drop outs. For my part, I was a little hesitant as my son’s wedding was on the cards. This was in March 2014. But my hubby insisted that I register and we will work around the wedding dates. And so I did! It took a few months to get a confirmation but I did. It seemed I was destined to do it. The date for the marathon is usually kept tentative because of the completely erratic weather patterns. In fact, one of the years the runners could not run on land as the weather was terrible and the poor souls had to finish the marathon on the ship! I left for Buenos Aires on March 1st and had just about finished with the wedding of my son. My training for the most difficult marathon was nowhere close to the others’ because of the wedding preparations. I started training on Feb 10th, 15 days in all, and somehow, there I was – very confident, with grit and determination on the plane to Buenos Aires. When we arrived, we met around 200 runners from different parts of the world. Thom Gilligan from Marathon tours gave us a presentation on how the marathon would be conducted. Did a city tour of Buenos Aires and also loosened up with a training run for 2 days. We boarded the 3hr flight to Ushuaia, the southern most tip of Argentina to embark on the ship Akademik Ioffe. I set on sail with child like happiness and excitement into the unchartered waters. 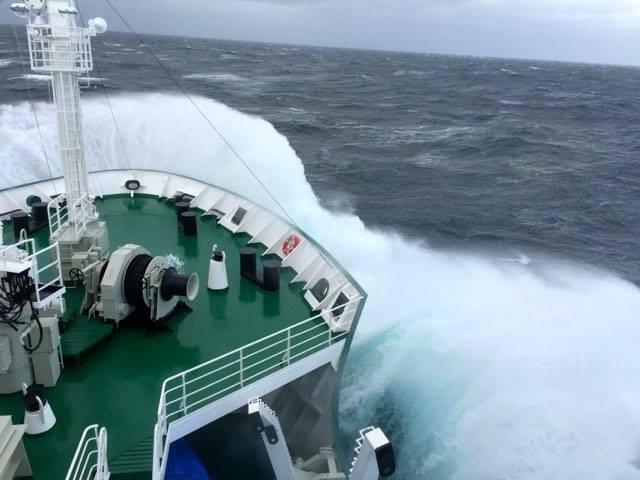 We were warned about the notorious Drake Passage, one of the roughest in the world. Out of the 95 runners on our ship, 90 of us were throwing our guts out. The ship sometime rose about 30 ft twirling and twisting around us. As we approached our destination on the 8th – King George’s Island,, all we could see was snow-capped mountains, the penguins and the seals. The temperatures were in the negative and the wind was excruciatingly cold. But the whole landscape appeared as a postcard….unparalleled beauty….no words to describe the feeling on being at the end of the world. ….the great Master and his strokes….unbelievable! So pristine is this land that you have to bio wash your shoes every time you set foot on the continent to avoid introducing new organisms. 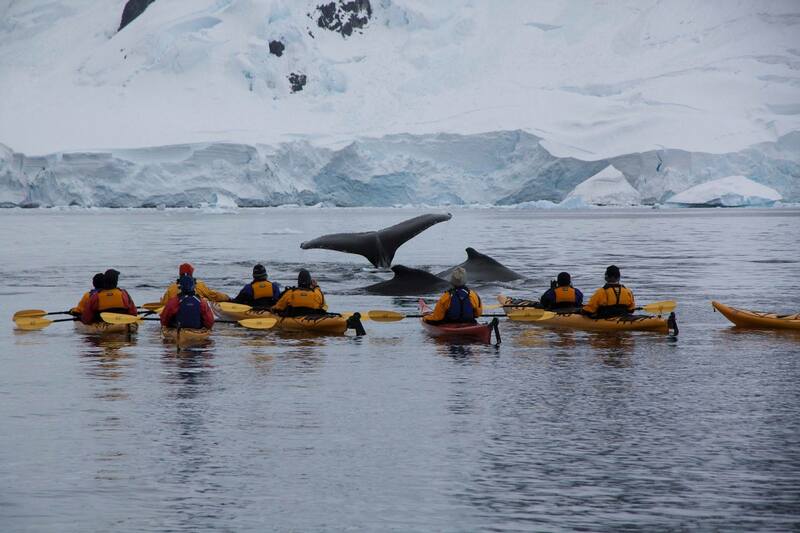 I discovered that on our acclimatization trip aboard the zodiacs (or boats) that carry you to the shore. 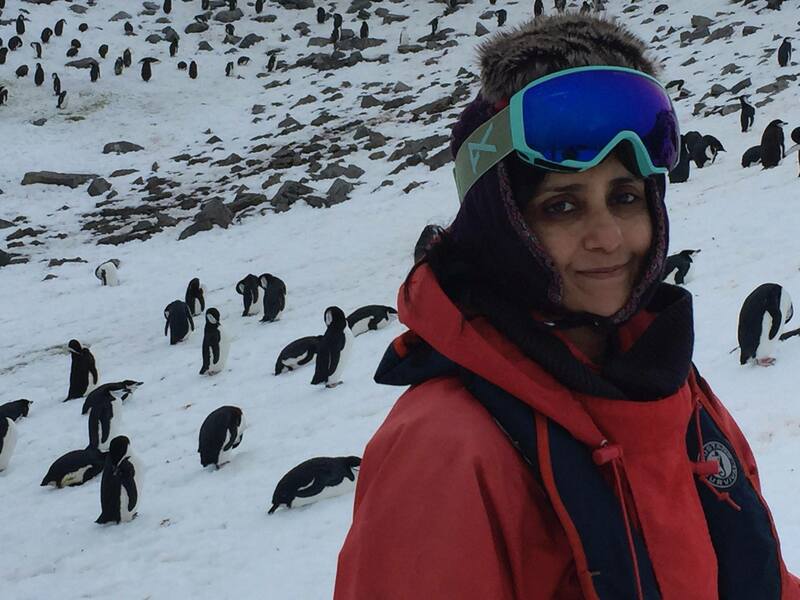 Greeted by thousands of penguins waddling on the ice, the sea lions lazing out in the sun, I felt a stranger on their land! In the evening, we were given instructions about the race. I had Butterflies in my tummy as the information poured in. Packed and re-packed that night for the race not knowing how many layers I would need. No gels are allowed in plastic wrappers which means that you can put gel in plastic bottles. You carry your own water in bottles marked with your name on it. No food is allowed on the continent. I could barely sleep, had 4 layers of winter clothing on top and 3 layers below. Had to wear the other waterproof gear on top of that. On the zodiac, we reached the Island at 7:30am. The wind and wind chill was so bad that wearing running shoes itself was a big challenge. Posed for pics at the start line with the Indian flag and I was beaming with pride of being an Indian. 7kms was good but I was not really in my form or comfort level. Things didn’t get better in the second loop and I knew I was still struggling. The wind was so harsh that I was unable to gain any momentum. I knew now that this was not my day. Runners cheered one another. The organisers were on their ATVs cheering. But this struggle was yours alone. Post the third loop, halfway through, I was told that I was 8 min beyond the cut off. I was trying to give everything I could but there was no energy to push probably because of the past few days on the ship. I told myself that I would just keep going at it with the hope of the second wind. But there was none today….I was exhausted. 5th loop, I thought it would be my first DNF. I felt miserable to have travelled to the end of the world to get a possible DNF. As my mind struggled with these feelings, my soul refused to quit….I was a runner….Tears welled up in my eyes and froze half way through. I grew weaker in my knees. I looked up into the sky for strength. Now it was snowing, the wind was less harsh. Suddenly I made peace with myself and came to terms that it was ok to get a DNF. I felt stronger. I pushed and pushed, made my way through the slippery slush, the icy incline and the rough pebbles. 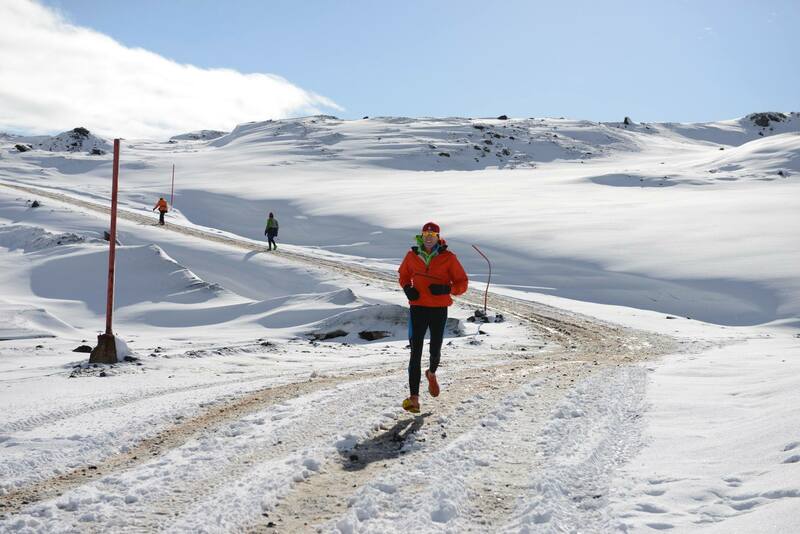 I was ready to face anything but wouldn’t give up till the end… I told myself that I was blessed to be running in Antarctica and not miss on the joy of being there. Despite the exhaustion, the beauty around was still mesmerising. Finally I made it to the finish line in 6:55 min with tears of joy rolling down. 6:30 was the cut off time. But since the weather was holding good and we runners looked reasonably strong, we were given the extra time. 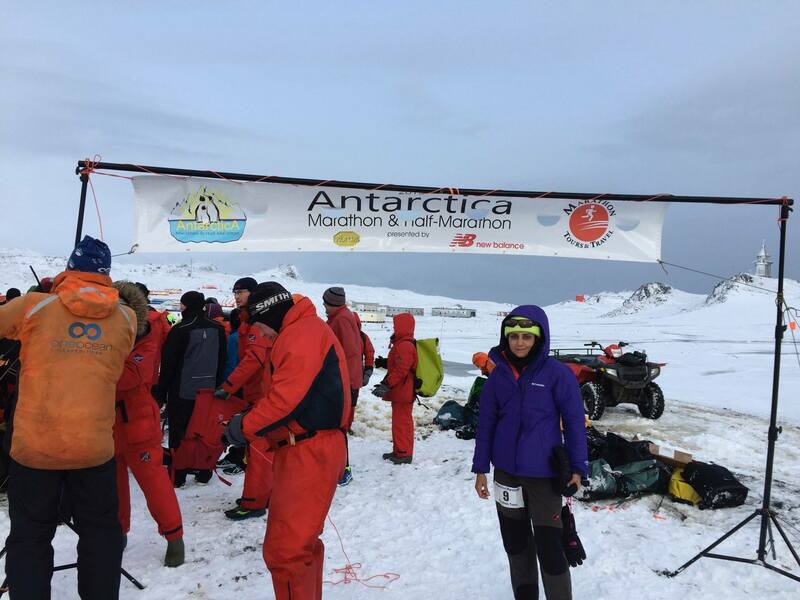 I could not believe that I had finished one of the toughest races on earth…..the picturesque Antarctica…A dream finally come true! 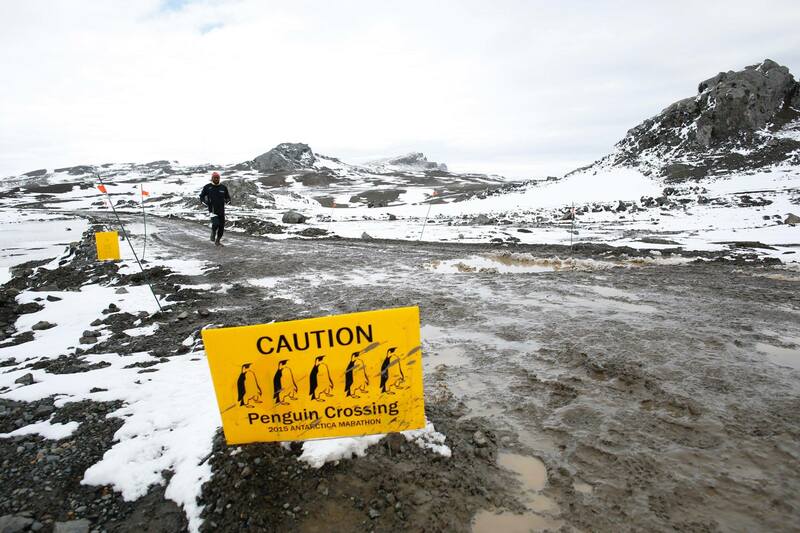 Antarctica and running a marathon there… made me realize one more time how tiny we and our lives are on this planet. The harshness of the weather and terrain made me more humble than before. 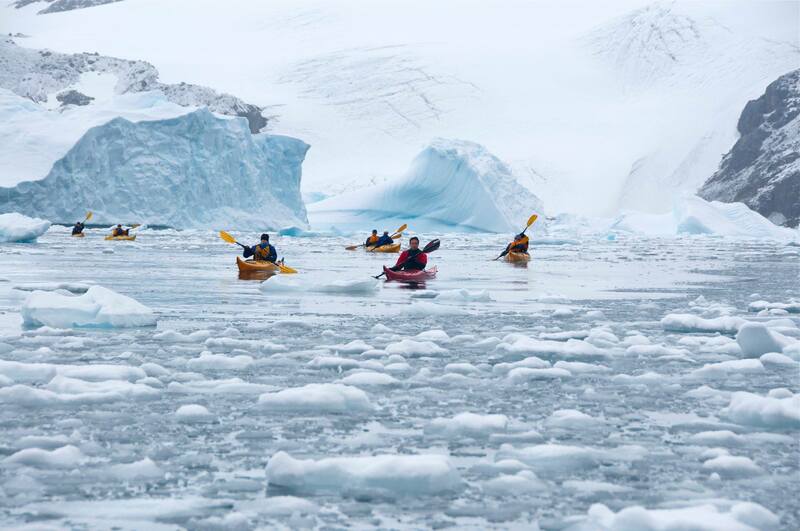 The ice bergs, the ice cap, the blue seas, the wild life, the stunning beauty around and running amidst all this wilderness will be unforgettable forever. By the next day, I recovered from the marathon. As the saying goes…Pain is only temporary… The wonders of human body…I was on cloud nine with my physical medal and my soul with the wonderful experience that could only be dreamt of! We did many day trips in the days after the marathon and got to see the wild life in close quarters. The life of penguins fascinated me. Went on zodiacs on icy waters with humpback whales swimming next to us. One strike and we would be in the waters. A playful seal entertained us by going below our zodiac and popping up every few minutes. Ice bergs of all sizes and shapes mesmerized me. The blue, the green, the aqua color of the icebergs have to be seen to be believed. 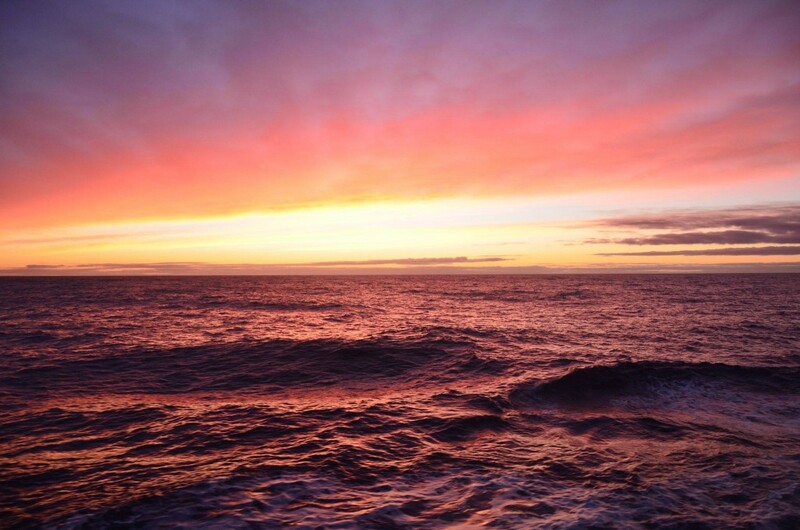 The storms in the sea, the gale, choppy waters was an adventure of a lifetime. 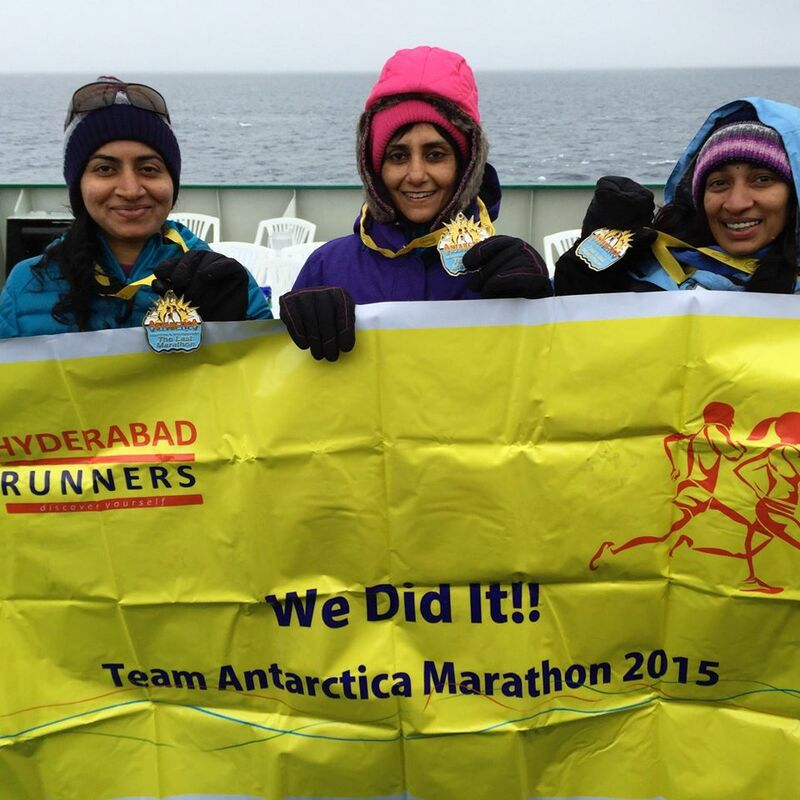 The conversation with runners from different parts of the world added more zest to the trip. With 70 percent of the world’s fresh water in Antarctica and the impact of the slowly disappearing ice caps makes you realize how important it is to keep Antarctica away from global warming. As they say…. The journey is always more important than the destination…..So has it been for me….The marathon was just an excuse to see Antarctica….And I got to see one of the most beautiful and incredible places on this earth and no matter how much I write, no words can do justice to it. It was an experience to just read your blog! Can imagine what you would have felt then! Hats off to your amazing grit n determination. People like you prove that nothing is impossible. You have our deepest admiration. I am full of tears after reading this… & it gave me courage to follow my travel plans on priority as experience is important. Really Nice!!! 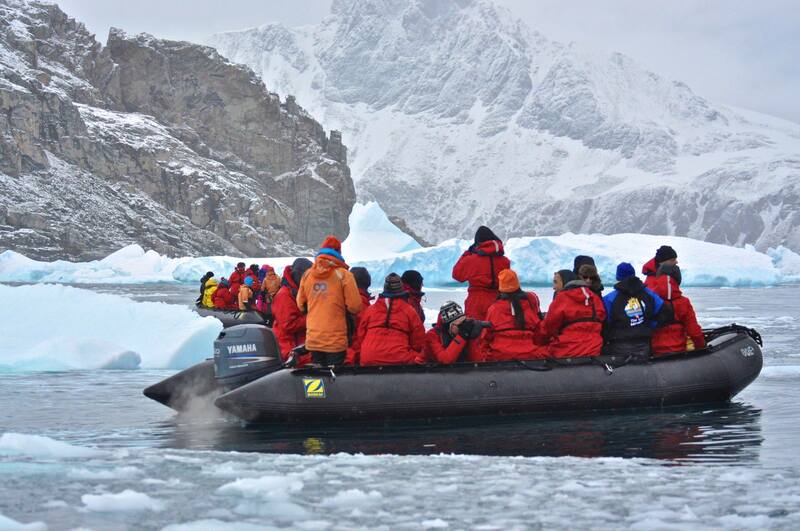 Could lived a glimpse of Antarctica from you words… Really amazed!! Nice…. Thank u Neha… U too can achieve your dreams… If I can so can u …Wishing u all the very best!!! While reading this I came to know ur real achievement of urself as an Indian n a grt runner…the body n mind worked together with high auto energitical levels of determination n devotion of graceful suggestions….may God be with u always..
Anu – This is a very beautifully written and motivational article. It is helfpul as I read it to help me prepare in my final days of training for the NYC marathon. Thank you! Thank u Durga… These experience make u so much humbler n yes there is always Divine intervention! Thank u Jasmin…wish u all the very best for Nyc. I dream to do it one day! I am glad I could inspire u!!! Very well written blog Anu. Relived the experience. It is an unforgettable experience. It was an amazing feeling reading and visualising your adventurous experience …can imagine your sense of self actualisation.. U feeling on top of the world. It’s indeed a dream come true.. One day, I wish I can dare to dream and emulate your grit and determination to achieve such a marvellous feat. U make us proud as a fellow Indian. U are a real inspiration.. Kudos to you. Thank u so much Vamsidhar!!! Amazing and Inspiring, to put it simply…..thank you for making us face our fears through your post! Incredible feet. God helps those who have the positive attitude and happy within. Great achievement. Your story is inspiration for all. Thank you so much… I am really very happy that I am able to inspire many… Thank u Anupriya for getting presenting my experience out so well!! “Suddenly I made peace with myself and came to terms that it was ok to get a DNF..” Just the moment when Heaven falls on earth .. nothing more beautiful that making peace with oneself and start living the moment. Thank you for sharing your experience and allowing us to live the moment. Your feat has left a trail of sweet scent of inspiration for others. You battled yourself every moment all the way till you finished. Thank u very much, Kalyan! I still cannot get over the fact that in spite of an acheivement of this magnitude you are so so humble.this is exactly what DOWN TO EARTH is. Jayanti… I think running makes you really humble because you connect to your real self and many a time it is the mind over the body… Suddenly u realise … It is your mind which is moving u especially when we r out there in the wilderness…. That there is so much in this world we miss and don’t even know. Brilliant! I am going to do this someday! Thank you Anupriya and Anu! Awesome.., it’s like dreams come true for anyone, Congratulation Anu, hope I could also enjoy such adventures any day.